At some point of your life you may have seen a photo of this desert dunes and these curious dead trees in a National Geographic’s article, a desktop wallpaper, or travel blog. This is the Namib Desert. 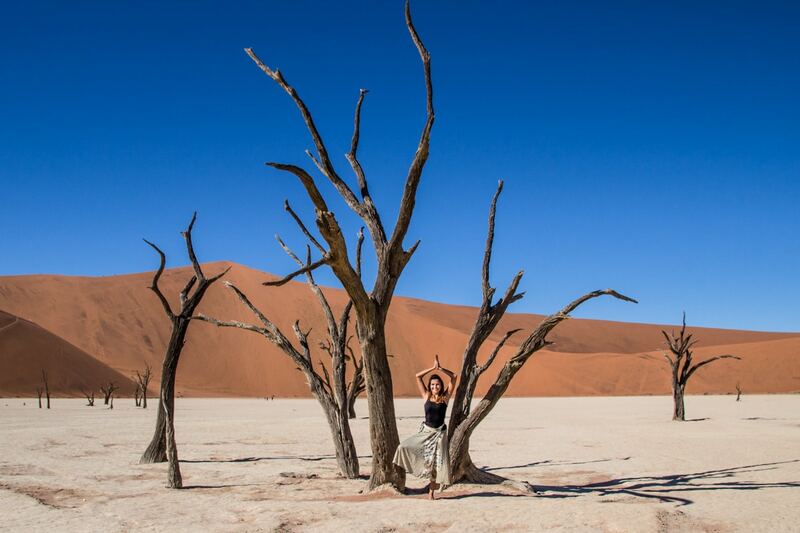 When I started researching about Namib Desert and realized that this is the country that hosts this stunning place called DeadVlei located in the Sossusvlei region, I got really obsessed about going there. 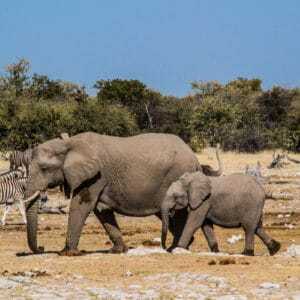 I had only 4 free days in my 2017 Africa’s itinerary which I could fit Namib Desert into it, and with the help of Chameleon Safaris I managed to make it happen as they have many tour options including a 3 day express tour to Sossusvlei, which is the one I took and now I would like to tell you all about it. Flamingo Villa Boutique Hotel Walvis Bay. I met up with the group at the hotel around 10:30am and we left there at 11am as it was winter, please notice that during summer they leave at 12pm. 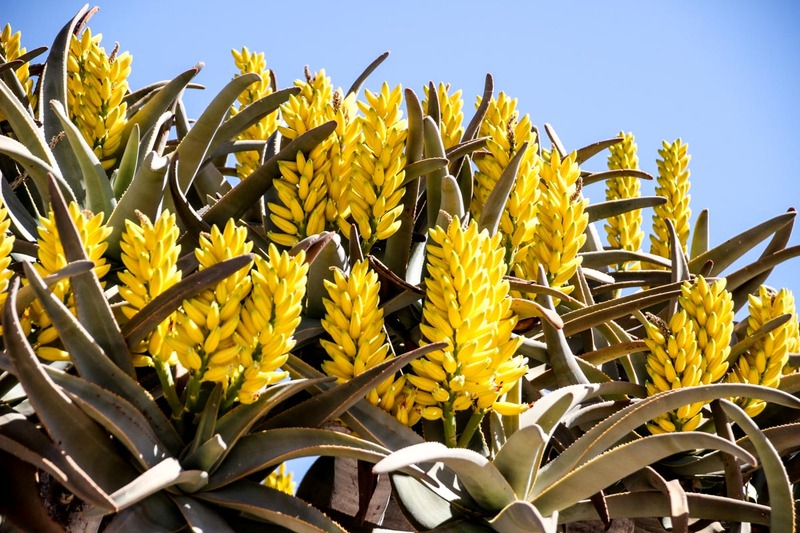 You will spend pretty much the whole day in the bus, stopping only for a few minutes at some cool places for pictures such as the Tropic of Capricorn Sign, Solitaire (a small desert town with gas station, bakery, shop…) and other places on the way where you can see aloe trees. During sunset time, we arrived at Desert Camp Lodge which was very cute and was about to be our “home” for the following 2 nights. 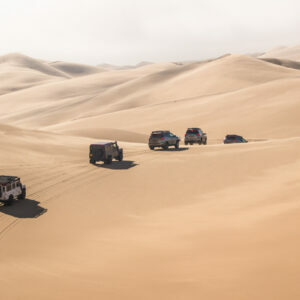 This is the most expected day of the tour, especially because it is time to see the dead trees and dunes, and of course, make one more dream come true. The bus leaves the camp very early to be at the park gate for the sunrise. 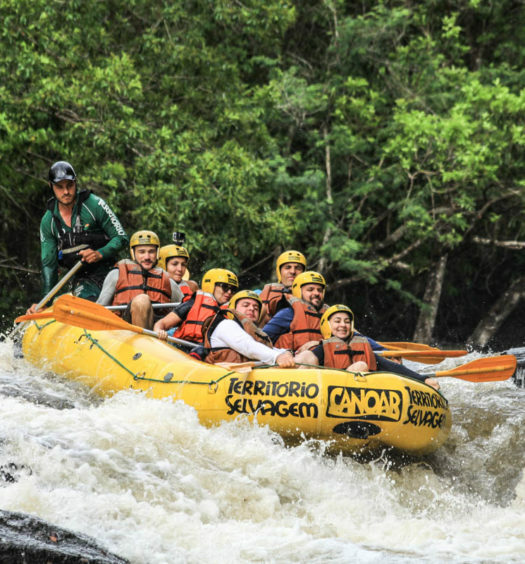 On the way, you will see many beautiful landscapes. 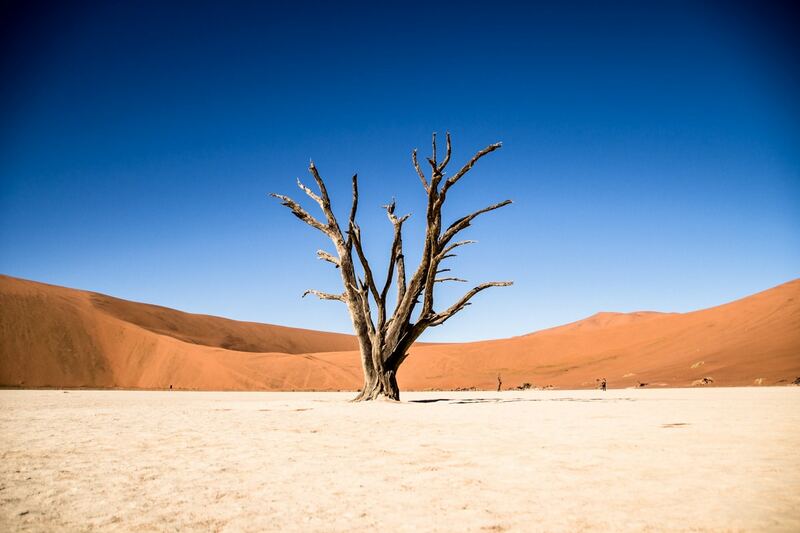 To go to Sossusvlei, the group leaves the bus at a point, take a 4×4, then hike 1km to go to DeadVlei. And then things get even better! The colours contrast between the sky, the sand and the trees form a fantastic landscape. 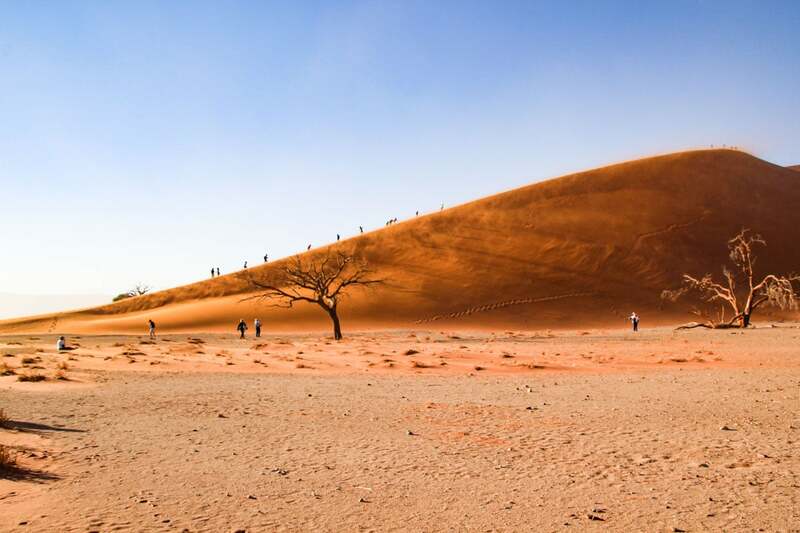 Besides DeadVlei, you will also see many great views of the desert dunes, including the famous Dune 45 which you can climb it up or just walk around. If it is too windy be careful with your belongings, as the wind may take them away from you like it happened to me haha. 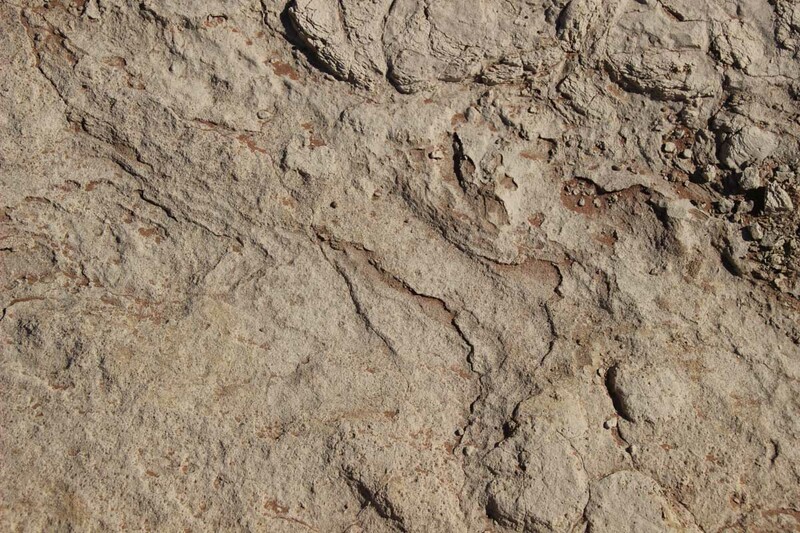 The tour returns to the camp and later you will take a 15 minutes bus ride to visit Sesriem Canyon. The bus heads to Solitaire in the morning. 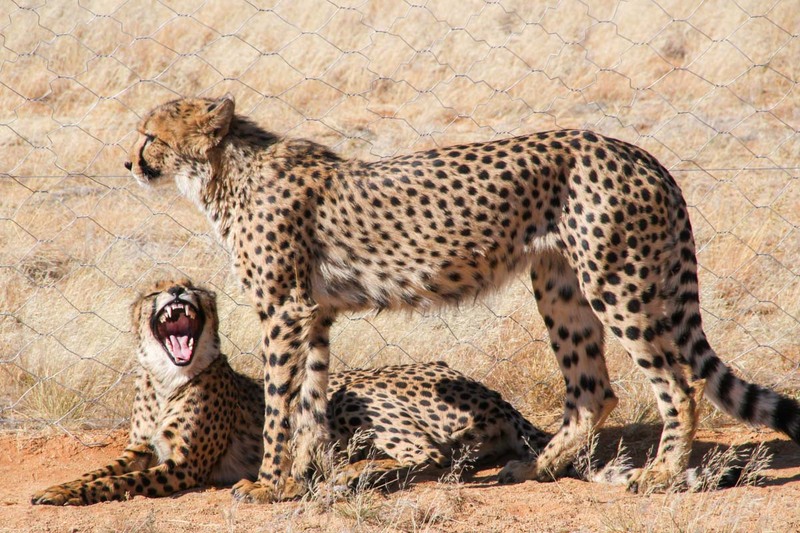 From there you will go to the N/a’an ku sê Wildlife Sanctuary to see the rescued cheetahs and then to Windhoek, which is the capital of Namibia and is where the tour ends. 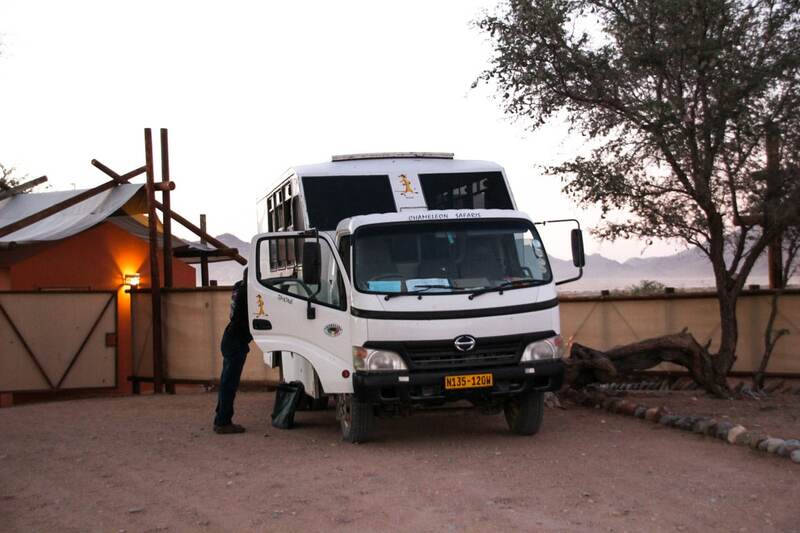 Note that the Windhoek Airport (WDH) is about 40 minutes away from the Chameleon Safaris office, where you will be dropped off. In case you fly on the same day as I did, I would recommend you take a flight that departs after 6pm. After a heavy rainfall, a river nearby called Tsauchab flooded and formed shallow pools of water. Allowing some Camel Thorn trees to grow. About 200 years later the climate changed, it got very dry and the dunes surrounded the area, blocking the river to access it. Without water these trees died and instead of decomposing they dried out. Apparently, the trees are about 900 years old. The reason why they are still standing until today is because Camel Thorn tree’s roots are very deep, they can grow up to 60m to find water sources. 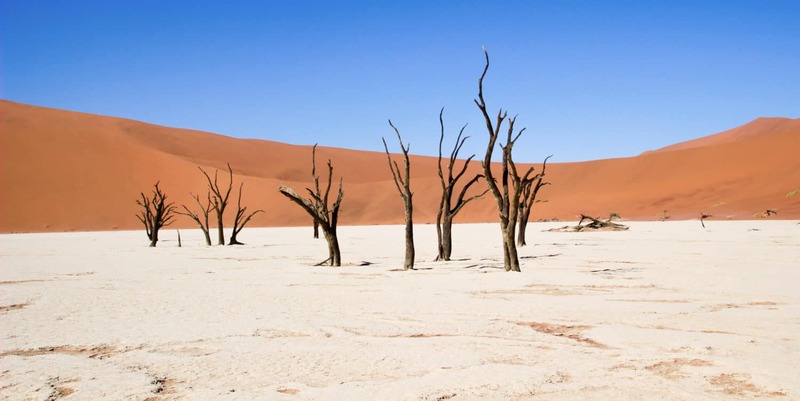 The best time to visit Namib Desert is during winter, because as you will have to hike under the sun you won’t feel too tired as the average temperature is about 23 degrees during the day. During summer the temperature can go up to 40 degrees Celsius and during the winter it can go down to 0 degrees at night. 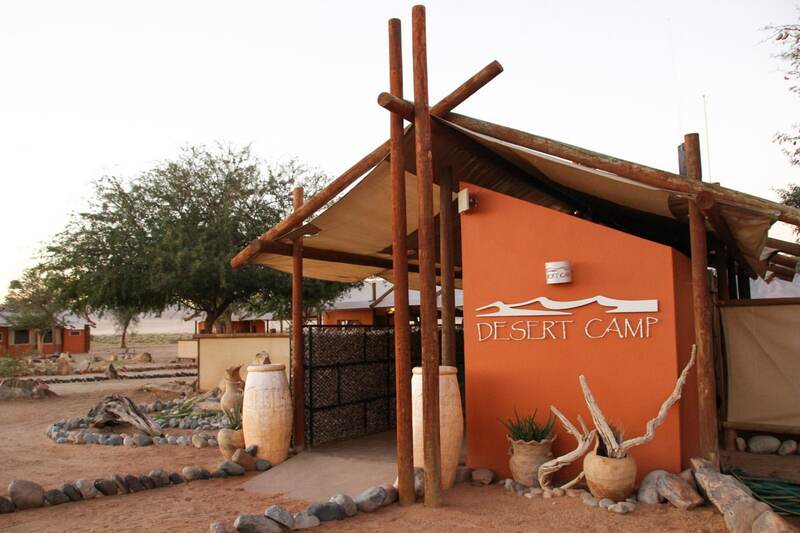 The accommodation is in permanent “adobe” style tents, with bathroom. I was sharing a tent with a girl that was in the same tour. The room was quite cute, it was very clean and organized. The bathroom and shower were both great, they provide towels to the guests, which helps a lot. 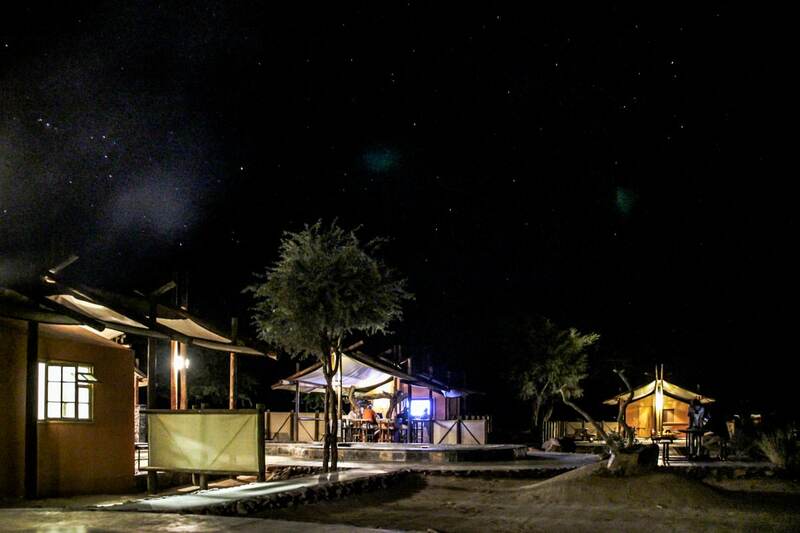 They have a swimming pool, a bar next to it, a kitchen and an AMAZING typical Namib Desert landscape. They also have wi-fi near the bar area, but it is not so good. What I liked the most about the camp is that I could see amazing sunrises, sunsets, moonrises and many stars & shooting stars from there! The meals are included, they are all simple but they are VERY tasty. The staff cooks very well. They ask you to wash your own dishes and if possible it is always nice to help the staff in the kitchen. You need to bring your own drinks to the tour, including water. The good thing is that it helps you to save money with beverages as you can buy in the supermarket. 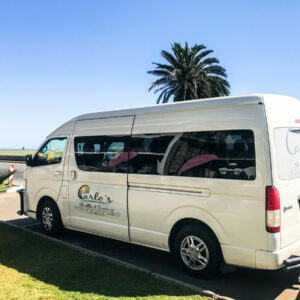 The Chameleon Safaris bus attends the needs but it is not super comfortable. It does not have air-conditioning, so they usually keep the windows opened. If you are very tall you need to try to be on the front seats so your legs won’t hurt after such long drives. But remember that this is a budget trip, so you get what you pay for. One or two Bandanas: They can be very useful in the desert to cover your mouth, hold your hair, etc. Ear plugs: If it is a windy night, the wind shakes the tent and it makes a lot of noise. Clothes for winter & summer: At least when I went (May) it was cold in the morning and evening, and very hot during the day. Hat: To protect from the sun. Socks: While you hike in the dunes you want to make sure you won’t get blisters due to the sand in your shoes. Water: They recommend buying a 5l bottle for the 3 days. I have a hydration bag, it helps a lot to balance the weight while hiking and I end up drinking more water than if when I carry a bottle. By your drinks at the supermarket near the hotel in Swakopmund, it is cheaper than in the gas station around Sesriem. Multiple USB charger, unless you have plenty of adaptors. Camera cleaner brush: To take off the sand that may get in your camera. Camera Tripod: In case you want to take cool night pics. I regretted not having one with me. 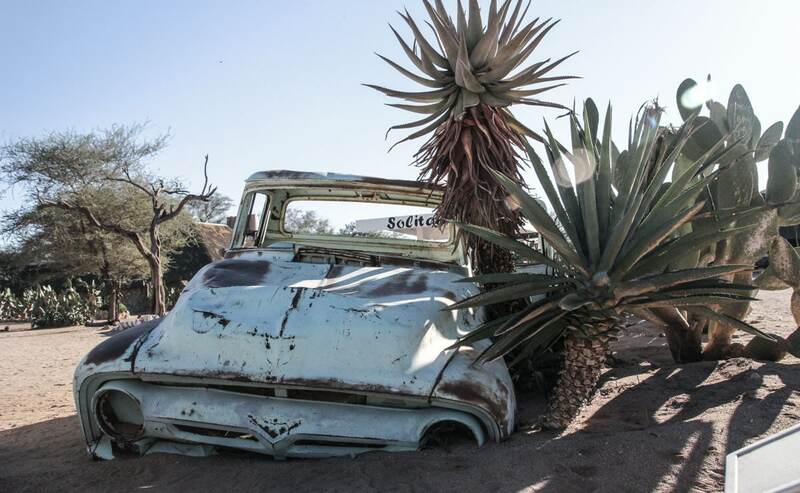 Think twice before taking your nice camera out of the case if you are in a windy spot in the desert. My camera zoom stopped working because of the sand that got in there, after using a brush to clean it started work again but I wish someone would have given me this advice before. Also, buy a filter to protect your lens, the sand may scratch it. 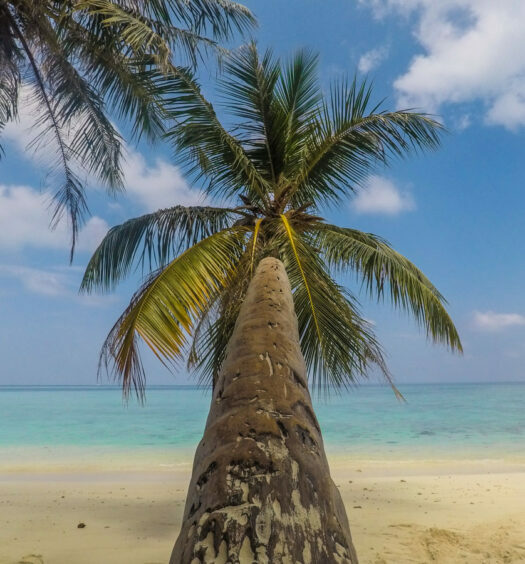 Don’t forget to get a travel insurance, we never know when it will be necessary. Check our post about Travel Medicine to get tips to keep heathy during your trip! You can find the prices and other tours on their website. 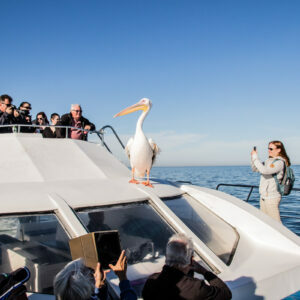 Discount => Get a 5% discount with Chameleon Safaris with this link. 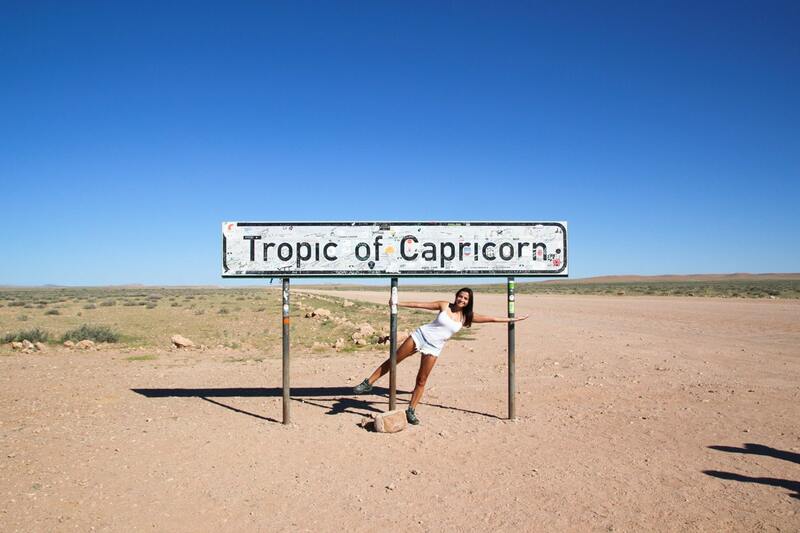 I hope Namib Desert will be as delightful to you as it was to me. No wonder why I went back there in 2018 and Namibia is now one of my favourite countries. 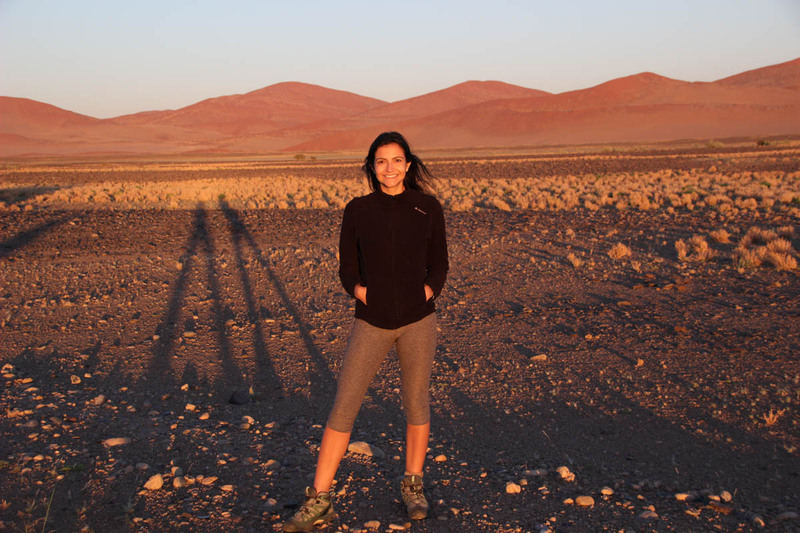 It is so cool to read a brazilian post about Namibia. It still a place who needs to be published in all of the world. Almost nobody knows how to get and do in there, in my opinion. As soon as I saw the desert pictures and video, I got Lençois Maranhenses in my mind. The difference of temperature is so big because the air is too dry. Congratulations! I love it!